Some days when you are writing a blog post the words just won’t come. I wanted to convey what a lovely day I had in Dublin yesterday. How I savoured every morsel of my green eggs and ham in Fumbally. How much I enjoyed the fantastic atmosphere in the Dublin Co-op Food market. The delights of Murphy’s valrhona chocolate & dingle sea salt ice cream and the interesting journey I had on the Luas red line but words are failing me on this lazy Sunday. I did manage to make piggy shaped pancakes for the children and some delicious brioche French toast so I will focus on that. I picked up the most delicious loaf of brioche in the market yesterday which I would consider driving to Dublin for. After doing a fast run on the treadmill this morning my energies needed to be restored and what better way than with some French toast. I always love Sunday morning breakfasts, nice to be able to linger over a pot of coffee and the newspapers. Place the butter into a large frying pan and allow to sizzle. Dip the brioche bread into the whisked eggs until completely covered. Place on pan and turn over once lightly browned. 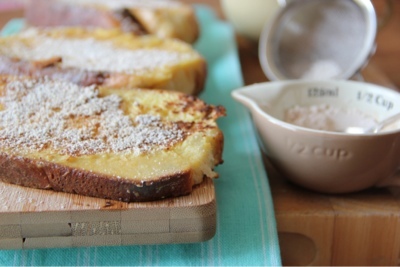 Mix the icing sugar and cinnamon together and sieve over the cooked French toast. Perfect Sunday morning breakfast to be accompanied with coffee, newspapers and your favourite people. One Response to Delicious French brioche toast! For years I struggled to find the perfect breakfast for my son before he goes to school in the morning. Tried everything from the healthy option of porridge to the last resort of Pop Tarts. Came across this post a few months ago and suddenly remembered what a treat French toast is. Now he has it every morning, just plain white sliced pan, with sugar and cinnamon, and we’re sorted. Of course, this would happen when he’s in his final year of school. Thanks for solving our breakfast problem.